There are many different types of schools that you can save for. Think beyond universities, and outside your state. With 529 college savings accounts, you can save for virtually any type of accredited two-year or four-year school including a public or private university, community college or vocational or trade school as well as for graduate schools in the United States and abroad. Just as the types of schools vary, so do their costs. 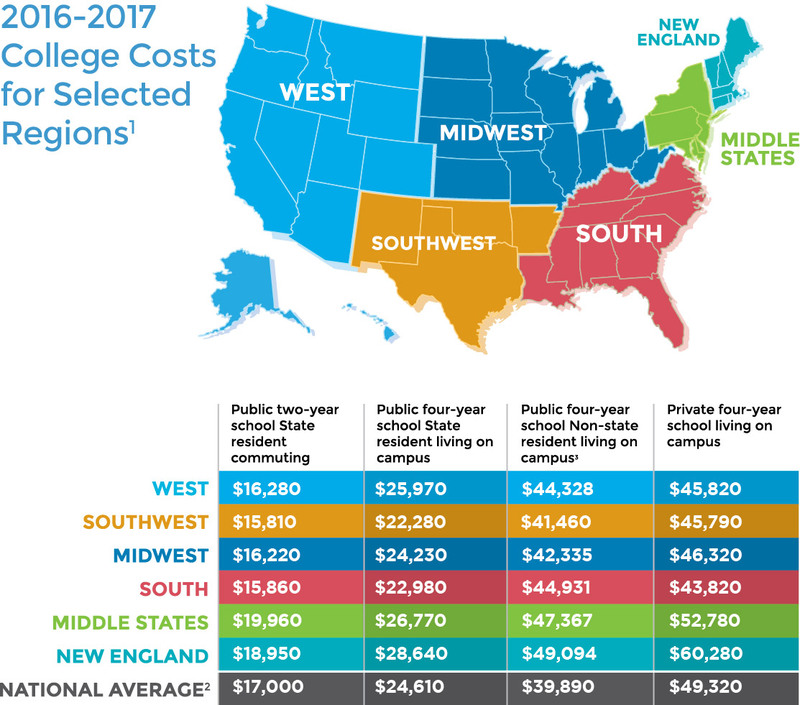 The graphic above uses data collected by the College Board to show the difference in total costs for various types of colleges across the U.S. It's less expensive to save than to borrow. We all know that savings earns interest and borrowing requires paying interest. Borrowing can add stress for both parents and students and the repayment can be daunting. For parents, retirement might be just a few short years away and for a graduate, their independent life is just beginning. Saving on the front end can alleviate some of the financial stress down the road. As the chart below illustrates, it's wise to save now rather than spend so much more in the future to pay back loans. 3Source: Tuition and Fees: Calculated the average by region from Figure 10. 2016-17 Tuition and Fees at Flagship Universities and Five-Year Percentage Change in Inflation-Adjusted In-State Tuition and Fees. Books and Supplies, Transportation and Other Expenses: Figure 1: Average Estimated Full-Time Undergraduate Budgets (Enrollment-Weighted) by Sector, 2016-17. Room and Board: For each schools listed by the College Board as Flagship Universities (Figure 10) actual room and board was determined for each school and then averaged by region with data from the specified College Board Flagship Universities individual cost of attendance reports on their website. The NEST Advisor Plan is sponsored by the State of Nebraska and administered by the Nebraska State Treasurer. The NEST Advisor Plan offers a series of investment portfolios within the Nebraska Educational Savings Plan Trust, which offers other investment portfolios not affiliated with the NEST Advisor Plan. 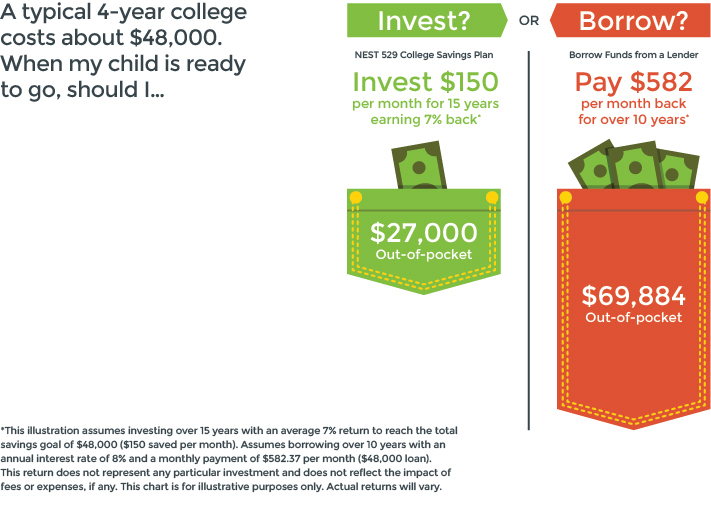 The NEST 529 Advisor Plan is intended to operate as a qualified tuition program to be used only to save for qualified higher education expenses, pursuant to Section 529 of the U.S. Internal Revenue Code. An investor should consider the Plan's investment objectives, risks, charges and expenses before investing. The Program Disclosure Statement, which contains more information, should be read carefully before investing. Investors should consider before investing whether their or their beneficiary's home state offers any state tax or other state benefits such as financial aid, scholarship funds, and protection from creditors that are only available for investments in such state's qualified tuition program and should consult their tax advisor, attorney and/or other advisor regarding their specific legal, investment or tax situation. This material is provided for general and educational purposes only and is not intended to provide legal, tax or investment advice, or for use to avoid penalties that may be imposed under U.S. federal tax laws. This material is not an offer to sell or a solicitation of an offer to buy any securities. Any offer to sell units within the Plan may only be made by the Program Disclosure Statement relating to the Plan. Participation in the Plan does not guarantee that contributions and the investment return on contributions, if any, will be adequate to cover future tuition and other higher education expenses, or that a beneficiary will be admitted to or permitted to continue to attend an eligible educational institution. Except for the Bank Savings Static Investment Option, investments in the NEST Advisor Plan are not guaranteed or insured by the FDIC or any other government agency and are not deposits or other obligations of any depository institution. Investments are not guaranteed or insured by the State of Nebraska, the Nebraska State Treasurer, the Nebraska Investment Council or First National Bank of Omaha or its authorized agents or their affiliates, and are subject to investment risks, including loss of the principal amount invested. FDIC insurance is provided for the Bank Savings Static Investment Option up to the maximum amount set by federal law, currently $250,000. First National Capital Markets and First National Bank of Omaha are affiliates.